In 1974, Ann Palmer and her sister, Virginia, purchased property in the heart of Lopez Island – a densely forested piece of land nestled next to Lopez Hill. 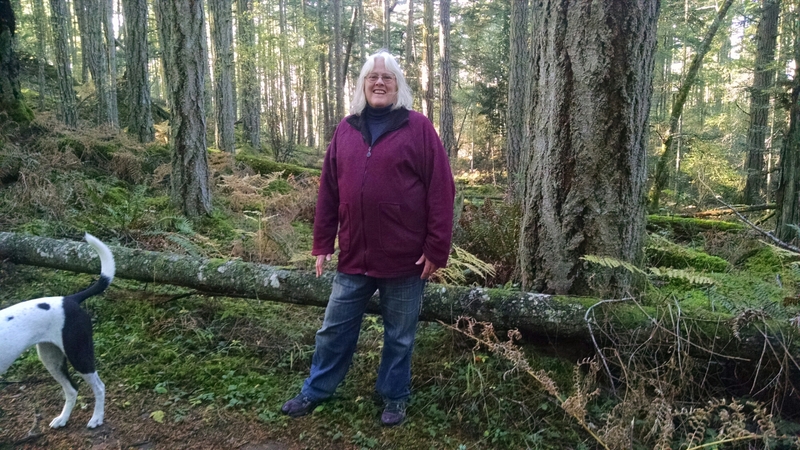 If you’ve ever been to Lopez Hill, you’ll understand what attracted Ann and her sister to this place – hundreds of acres of forestland, blanked by a layer of thick, green moss. And very, very quiet. “You don’t have many places that have gone this untouched on Lopez,” explained Ann, as she and I walked from her property onto Lopez Hill recently. Ann moved to Lopez in 1984 so she could live full time in this pristine, open space. For the past thirty years she’s worked with other Lopezians like Adrienne Adams and Dan Christopherson to gradually create hiking, biking and horse riding trails that wind through Lopez Hill, a 400-acre piece of property owned by the Washington State Department of Natural Resources (DNR) and managed by the San Juan County Land Bank. After being surrounded by paradise for so long, you can imagine Ann’s complete shock when, in 2005, she learned that the DNR was getting ready to divest itself of Lopez Hill and was in talks with a developer. And not just any developer. The DNR was in talks to sell the land to one of the biggest resort developers in the United States. Ann and many others, including Adrienne and Dan, knew they had to take action quickly to try to stop this sale. The challenge was that, not unlike today, most Lopezians had either never heard of Lopez Hill or had never been there. “In order to protect it, we knew we had to talk about it,” said Ann as she gave me a Lopez Hill history lesson. Knowing they were likely entering into a political battle, Ann and other friends of Lopez Hill employed the help of two people with political connections, Bob Myhr and Tom Cowan, who began discussions with the DNR and started lobbying state representatives. A group including Ann, Adrienne, Dan and others started the Friends of Lopez Hill organization to help ignite local support and create more marked trails on the land. Kids from Lopez School helped with a letter writing campaign. 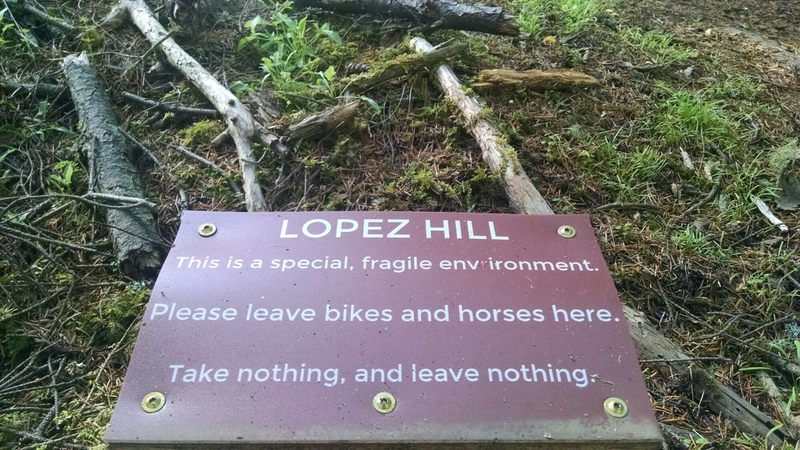 Pretty soon, lots of people were talking about Lopez Hill. 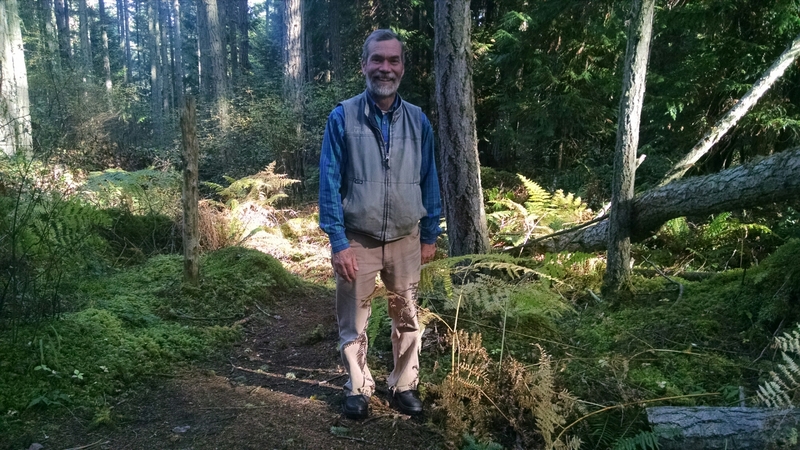 After several years of education, political wrangling and community conversations, in 2009, the Washington State legislature voted to put Lopez Hill into the Trust Land Transfer Program. A $5-million 50-year lease to San Juan County, placed Lopez Hill under the management of the Land Bank. Lopez Hill was – at least temporarily – preserved. The DNR, whose mission is, in part, to generate revenue from its land holdings to fund schools, was willing to go this route because other ways of extracting money from Lopez Hill weren’t very lucrative in 2009. Logging isn’t very economical on an island. And in 2009 at the height of the recession, property sales had slowed considerably. What happens in 44 years when the Lopez Hill lease expires? There’s no guarantee that the DNR won’t again entertain offers from other resort developers. San Juan County does have the option to renew the lease at that point, but there’s also no guarantee it’ll be in the financial position to do so. The County does have the option to purchase the land between now and 2059 when the lease runs out. The value of the remaining lease, which has already been paid, would be applied against the purchase price of the land, assessed at $6 million in 2007. Bottom line, for approximately $1 million today, the community could purchase Lopez Hill – preserving 400 acres of relatively untouched land for the community forever. That price will go up as the time remaining on the lease decreases and as land prices go up, now that the economy has recovered. A million dollars is still a lot of money. As a Lopez resident, I needed to better understand what’s so special about Lopez Hill, which is why I paid Ann Palmer a visit. It’s also why I asked Tim Clark, Lopez Preserve Steward and a member of the Land Bank staff, to give me a tour of Lopez Hill a few weeks ago. Tim generously spent more than two hours leading me around the labyrinth that is Lopez Hill, educating me about the value of preserving these types of public lands and pointing out trees, plants and wildlife that can only be found there. He also lent me his orange vest to wear when I discovered it was the middle of hunting season (we neither saw nor heard any hunters in the time we spent on the hill). As we walked and talked, I understood why somebody like Tim Clark is so valuable. All along the way he was clearing limbs from the path and making note of parts of the trail that needed fixing. Tim also showed me some of the experiments he’s conducting, including a fenced off area to help show the impact deer have on the land. It was quite an education. Two hours on Lopez Hill was all I needed to be convinced that the community needs to find a way to purchase this very special, and scarce piece of property. 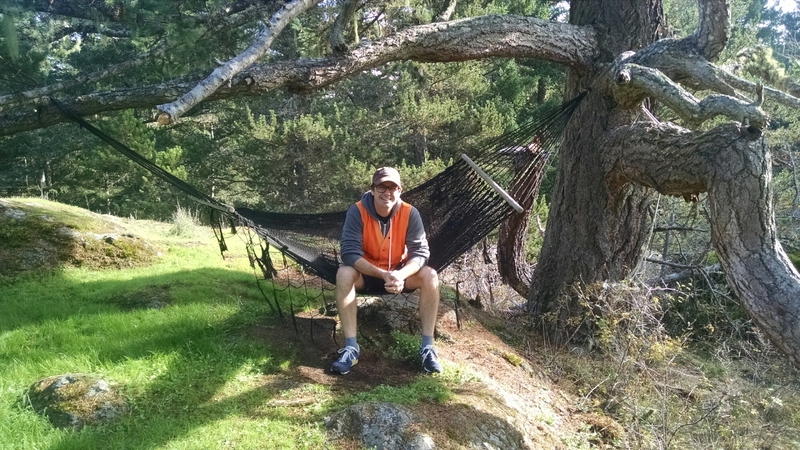 Tim and I hiked to the top of Lopez Hill, where there hangs a hammock to reward people who make it to the top. I was struck by just how quiet it was up there. Surrounded by trees, it really did seem like I was in the middle of nowhere. I can’t think of another place on Lopez I could hike for two hours without seeing any signs of civilization. What’s the plan for rallying community support and funds to purchase Lopez Hill? That’s where Kirm Taylor and the Lopez Community Trails Network (LCTN) enters the picture. 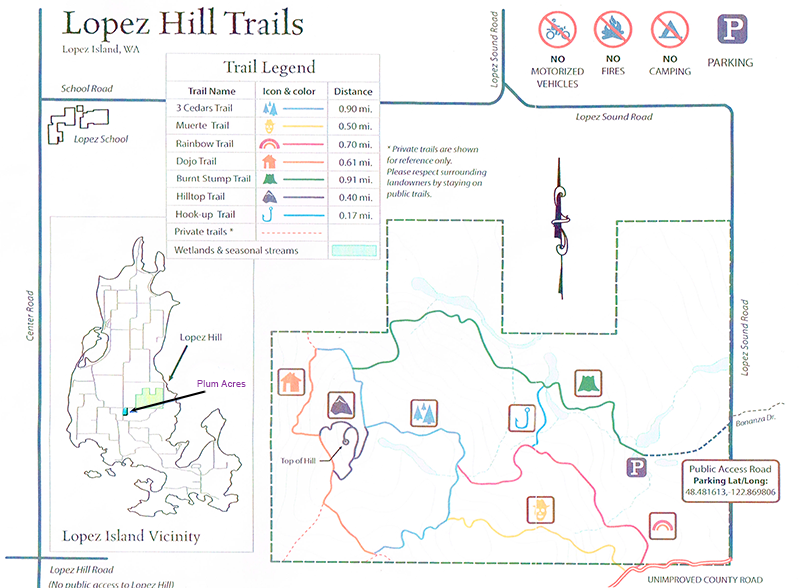 In 2009, Kirm and several other Lopezians started LCTN to help create and improve “an interconnected system of trails and open spaces for all users.” Lopez Hill is a crucial link between the South and North ends of the island, so helping to secure this property in perpetuity fits squarely within the mission of LCTN. 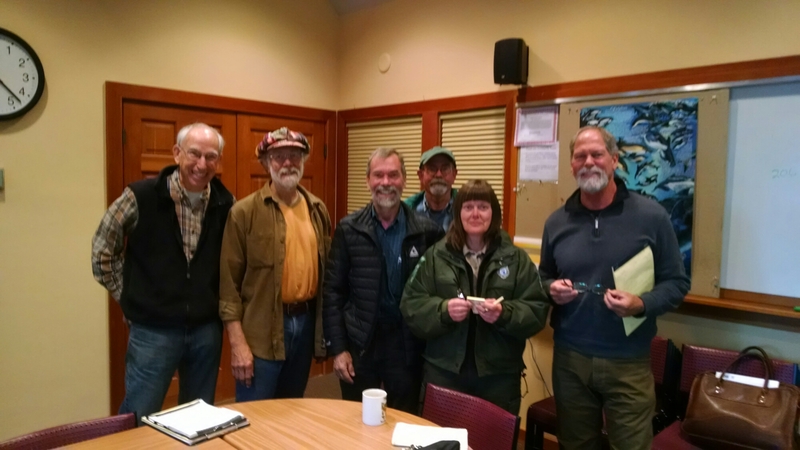 Kirm and a large group of volunteers meet twice a month to discuss the maintenance of existing trails, creation of new trails, and other ways to increase the hiking, biking and horseback riding opportunities on Lopez. Chief among those is the annual Lopez Walkabout, a two day hike from one end of Lopez Island to the other with the objective of staying off public roadways. Between LCTN, the Land Bank and Friends of Lopez Hill, there appears to be some momentum building for the permanent purchase of this property. Ultimately, if these lands are to be preserved in perpetuity, it’ll take the effort of the entire community. If you’ve never been to Lopez Hill or Odlin Park South, I encourage you to spend a few hours getting lost there. If you want to learn more, check out the information on the FOLH and LCTN web sites. And, if you want to join the cause to take the Hill, send an email to Kirm Taylor (info@LopezTrails.org) or call 468-2474. Nice article, Tim. You really captured the important points. BTW, it’s Bob Myhr, not Meyer. Thanks! Thank you for this informative tour of Lopez hill. I did not know it existed until now. The next time we visit Lopez we certainly will want to walk it. Thank for Project 468.